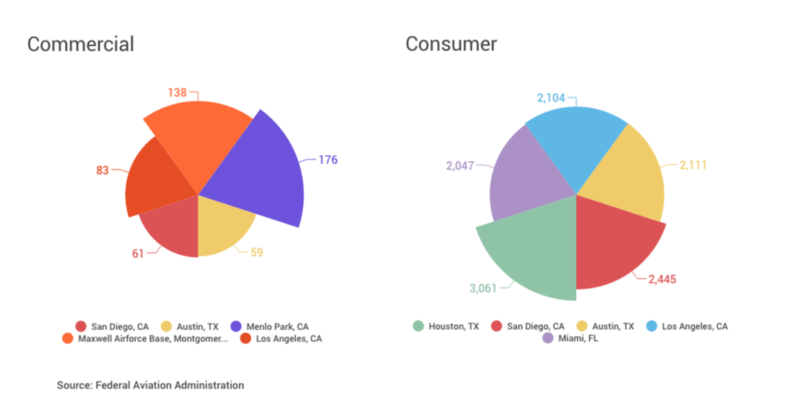 Overall, according to the FAA, the state of California has the highest number of registered drones in the U.S. Menlo Park is number one in commercial drone registrations, while Houston is home to the most recreational drone registrations. These numbers show promising adoption and growth in the drone industry. As of May 31, 2016 the FAA has approved 5,292 exemptions and earlier this year they passed provisions making the certification process much easier. Drone operators will be able to take a test at a knowledge center, and a commercial pilot license will no longer be required. The consumer drone market is currently the largest non-military market today and is still early in development relative to other consumer electronics. There is still a substantial amount of growth potential ahead. A recent Goldman Sachs report forecasts that the consumer market will grow from a $1.6 billion market in 2015 to $3.3 billion by 2020, while the global market opportunity for commercial drone sales is estimated at $20.6 billion. Interested in commercial aerial mapping? It's never been easier. Start your free Skycatch trial to generate high-quality orthomaps and 3D models. Flying a DJI drone? Download COMMANDER to automate your flights and start mapping in minutes.